NOW NEW WITH ADDITIONAL SMALL BEDROOM !!! 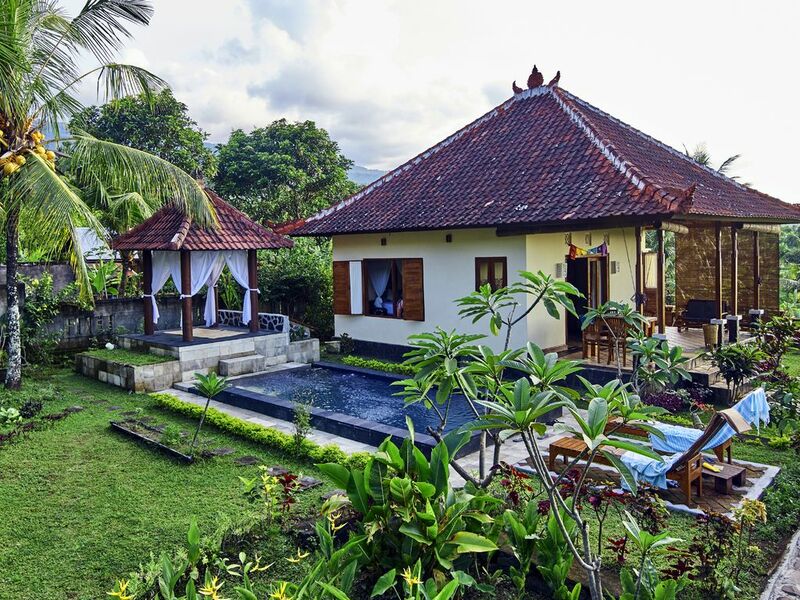 Lovingly designed Balinese holiday home, with private pool, stunning views. In the rice fields and the Bali-Sea Kitchenette, right European toilet. A shower in the open air with great attention to detail. large terrace invites you to linger. An open-bed integrated into the terrace offer a nice place to dream, reading, relaxing. It offers natural Balinese environment. Look for in the Hindu ceremonies in their own land temple. You are cordially invited to join in. Enjoy your time in Bali in natural surroundings and get to know the original and traditional Bali far from the tourist area. Enjoy the view of paddy fields, ocean, mountains and volcanoes + a gorgeous sunset. At desire you can also like the owner's own car use (small daily surcharge). Our guide will be happy to help for excursions on foot or by bike. The beach can be reached by moped or car easily in 2-5 km. To live you Villa Lafyu also means helping people who live directly in the vicinity and are working with us. The garden is planted with many native plants, herbs and fruits and vegetables. Learn what healing effect each and learn to cook traditional Balinese. We are located in the Sectret Garden of Sambangan, in close proximity to the 7 waterfalls. For a rental period of at least 1 week, the guest receives 1 free massage per week per guest! We also serve vegetarian breakfast on request and also cook for you vegetarian and vegan. Ask us !